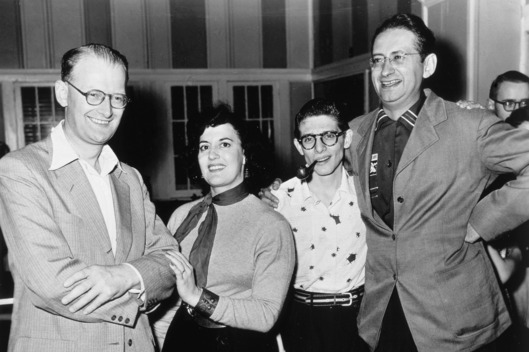 Photo, L to R: Arthur C. Clarke, Evelyn Gold, Harlan Ellison and Robert Bloch in 1952. Clarke and Bloch were both born in 1917. By Bill Higgins: Today is the 100th anniversary of Sir Arthur C. Clarke’s birth. I would’ve liked to attend a Clarke centennial event of some kind, but I live far away from any of them. I did celebrate in a small way on Twitter: I rounded up links to interesting reviews for each of Sir Arthur’s solo novels, and tweeted them out in chronological order, along with cover art. City of Diaspar, though it defied Time for a billion years, could not withstand #ArthurCClarke's urge to rewrite it. FALL OF MOONDUST's quicksand-like dust sea did not turn up on the Moon. But asteroid 433 Eros has hundreds of dust ponds. by which time a @DelReyBooks paperback was out. All praise to the mighty and indispensable https://t.co/EWym5NAwqo, whose very existence seems a secular miracle. This entry was posted in Book Reviews and tagged Arthur C. Clarke, Bill Higgins by Mike Glyer. Bookmark the permalink. The thing that makes it even funnier now is that I wouldn’t be at all surprised by a university press Shane, even though Clarke’s joking. This caught my eye because there is a university press version of Shane; the University of Nebraska Press published one in 1984, and it’s the version of Shane I read. I’m not a big fan of the Western genre, so I found the essays included to be very interesting. When I was a forecaster at Cape Canaveral in the mid ’70s, I could (and did) arrange for people–fans and pros–to launch weather rockets from the pad at the tip of the Cape. Alas, I never got to have Arthur Clarke launch a rocket: the only time I met him at the Cape (specifically at one of Joe Green’s famous launch parties), his schedule didn’t allow him to: a disappointment to him and me. You’d be surprised, or maybe not, that some writers who had been sending rockets across the galaxy for decades, would be blase about such things as launching a weather rocket. But no…with a real countdown and a real switch to throw, and a real whoosh as the rocket took off–they one and all *loved* it. Every fan or pro looking out the window of the “block-cottage” (it wasn’t big enough to be called a blockhouse) and seeing the rocket take off had a great big grin on his (or her) face. I remember that Gordon Dickson’s grin went all the way to the back of his neck! Guest launchers would get a certificate and a copy of the data their rocket collected. (The weather rockets were solid-fueled and about 6 ft long and 3-4 inches in diameter, and had a yard-long, inch-diameter dart on the nose containing the temperature probe hanging from a small parachute. The rocket motor would burn for 2-3 seconds and reach a height of some 5,000 ft, at which point the dart would detach and coast up to 200,000 ft or more. The probe would be deployed and tracked by radio direction finding, from which air temperature, wind speed and wind direction at various altitudes would be calculated. The motor casing, the empty dart, and the probe would fall into the ocean off the Cape. They still launch weather rockets from the Cape, but don’t allow “outsiders” to launch them now, I understand. I have a printers’ proof (without lettering) of Paul Lehr’s cover for the first paperback of “The Deep Range” hanging on my wall. Mm-at the UK’s annual Natl SF Con (Eastercon) 2001 (I think it was in Hinckley that year) I arranged for a large p/card to be sent to ACC (he and I are both FRASs so I had his Colombo address). It originally was only to comprise Cttee and Guests but like topsy it got out of hand. Everyone at the Con (even the Gen Mgr of the Con Hotel put his Hotel official stamp thereon) wanted to add to it so we had to keep adding sheets of white paper to the p/card. Artistes there also added to the glee-with illustrations. Before airmailing it to SriLanka (registered) I took p/copies of same (those are now in the SF Foundation at Univ of L’pool). ~ 3 weeks later a nice thankful reply came from ACC: as usual on one side was a pre-typed piece saying what he was doing or planning -with a hand written item on the reverse. Samuel Long: Thanks for a fascinating and obscure bit of space history! I had no idea. I’ve shown a lot of fans and SF writers around Fermilab but could not offer them the experience of pushing any buttons, let alone the thrill of launching a rocket. Once in 1988, though, I did get to show Jack Williamson, author of the classic Seetee series, a real-life antimatter factory and storage ring. We gazed out the window at it– nobody was allowed in the tunnels while the beam was operating! 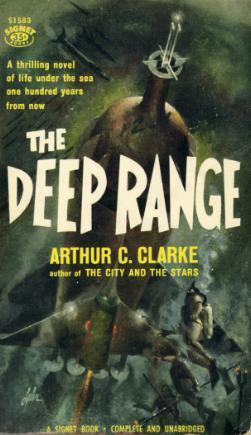 Joel Zakem: The Deep Range is a novel set largely under the sea. It’s surprising then that a painter like Paul Lehr, renowned for populating so many of his SF landscapes with his signature shimmering spheres and hemispheres, passed up the opportunity to put a lot more bubbles into this particular cover.